A New CC Sabathia, Or The End of CC Sabathia? 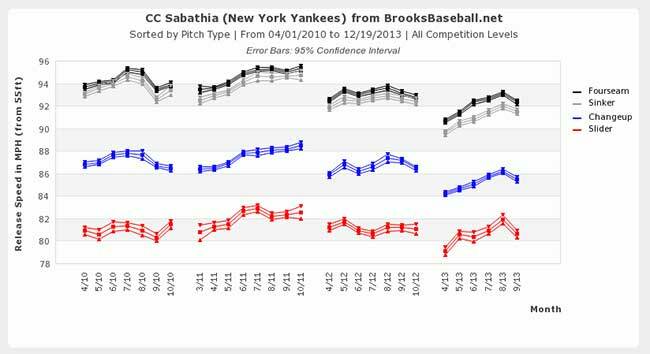 Lest it seem like CC Sabathia simply fell apart out of nowhere in 2013, do remember that there were warning signs in 2012. Yes, he was still great that year, pitching 200 innings on the nose with one of the best K/BB marks of his career, but he’d done so while losing a mile off his fastball, landing on the disabled list twice, and submitting to elbow surgery following the season. The optimistic view notes that his velocity was actually increasing for much of the season before falling back off in August, and the drop was abated by a hamstring pull that cost him the final weeks of the season. The pragmatic view notes that he turns 34 in July, and has 2,775.1 major league innings on that left arm already, plus more than 100 more in the postseason. He’s one of just 87 starters since World War II to pitch that many regular season innings, and if he’s able to get another 200 next year, he’ll be just outside the top 60. Sabathia’s been a great starter for a long time, but the workload and velocity drop make it more than fair to wonder if not only his best days are behind him, but also his days as an effective starter. I’m not pretending to be an expert on pitch mechanics, but it’s tough to look at these two charts — declining velocity, lowered release point — and think it’s simply a coincidence. It looks like Sabathia made an effort to change that in the second half of 2013, but it didn’t particularly help, since a .319 wOBA against in the first half went to a .361 wOBA in the second half. This is all bad news, though it’s probably important to point out that even in the worst year of his career, Sabathia wasn’t awful. Plenty of pitchers would kill for a 7.46 K/9 and 2.77 BB/9 and a 4.10 FIP, but coming from a guy with his history, it just looks bad — and continually increasing homer problems, especially in that park, aren’t helping. 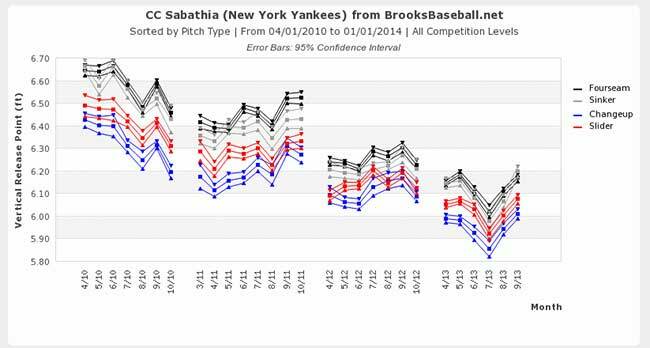 Looking ahead to 2014, Sabathia represents a huge unknown. The hamstring injury could either further limit him, or push him to be in the best physical condition he can be due to the rehab necessary. His velocity and arm slot could continue to fall, making 2013 just the beginning of the end. I’m not ready to write him off yet, partially because Sabathia has never been a pitcher who has survived only by being a flamethrower. We’ve seen lefties far less talented than he survive for years throwing far slower. From a fantasy perspective, that’s probably not particularly exciting, and I’m guessing his name and “being the ace of the Yankees” gets him drafted a few rounds earlier than he ought to be. I’d be happy to take a chance on him as a third-tier starter, but he won’t be valued that way, so tread carefully. We hoped you liked reading A New CC Sabathia, Or The End of CC Sabathia? by Mike Petriello! Stick a fork in him . . . uh, if you can. Could be tough, he’ll probably try to stop you.